Shop Levys PM48NP3 3 Inch Neoprene Padded Guitar Strap with Leather Ends from AMS with 0% Interest Payment Plans and Free Shipping. 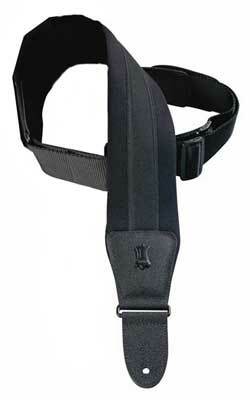 The Levy’s PM48NP3 is a 3 1/2 inch neoprene padded guitar strap with leather ends. Also has 2 inch polypropylene webbing with tri-glide adjustment at back end. A great leather strap with a rich look and feel. Well made, but if you are under 6’ and don’t have a massive belly, or aren’t interested in developing tendinitis, this strap is likely too long for you. A friend didn't like this strap and gave it to me, but it is the best strap I have ever had, the last 6 years, over decades of gigs experience. Used it on lots of gigs with a heavy 1999 Godin LGXT Synth guitar upwards to 5 hours on a gig. Not perfect, the weight of the LGXT starts to get to me, but this strap definitely helps a lot to fend it off. Recommended. I use Schaller Strap lock buttons on my guitars and keep the Schaller buckets on this one, so it is easy to carry to other gigs in my cord bags. E.g., one gig recently I played bass for my band when our bassist couldn't make a rain date change. Worked great with a five string bass too.